You know what pool tables are. In fact, you have probably seen them so many times you have lost count. Maybe your grandpa had one and frequently played while you watched. Or perhaps the local bar makes an event out of their pool tables. Now you want to have one of your own. 1. Are You Really Going To Use It? The idea of having a pool table in your basement or den may be appealing, but you have to stop and think first. Are you really going to use it, or are you simply excited to have one? Are your children and their friends going to play with it, or would you reserve it for special occasions? If you do not think that you are going to play with it, or only rarely, a pool table may not be right for your household. 2. How Big Should It Be? Where Can You Put It? Pool tables are not exactly small, especially if you want to have one that several people can use at one time. If you want to add one to a certain area in your house, you will need to make sure that there is room before purchasing anything. 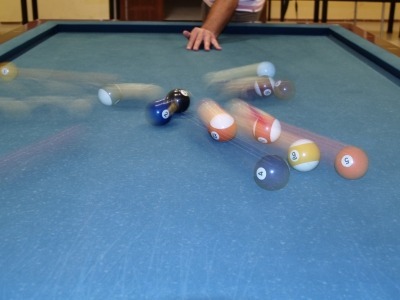 A pool table usually requires a six foot perimeter around the table to allow players to move around comfortably. You will need to have exact measurements available when you purchase your table, or you could be in for a surprise. Once the pool table is in your house, you cannot expect the money to stop flowing. After all, if you want to actually play the game, you are going to need accessories. How can you hit any of the balls if you do not have cues? How can you use your cues if you do not have balls to hit? You will be expected to spend a lot more money in order to keep a pool table area that your neighbors can be jealous of. Cheapskates should stay away from this recreation if they can. 4. Are You Willing To Take Care Of It? If you love your pool table and use every excuse to break out the cue chalk, sooner or later something is going to give. 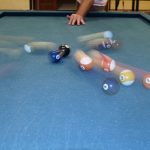 The cloth on your pool table may start to wear down or rip considerably. You may run out of chalk or somebody will break something important. Well, this means you are going to have to have the problems fixed, and fixed soon. This implies taking responsibility; are you willing to do that? Are you willing to spend more money in the future? Ask your kids if they are willing to help you make the pool table last a long time. Pool tables are very much in the public mind, and you may find yourself fascinated to such an extent that you want to have one of your own. Before you bring out the credit card, however, you need to think it over. Can you afford to have one? Do you have the space, and can you even convince your landlord, if applicable, how much you need one? With some planning and thought, you and your family can have their very own pool party, minus any water.